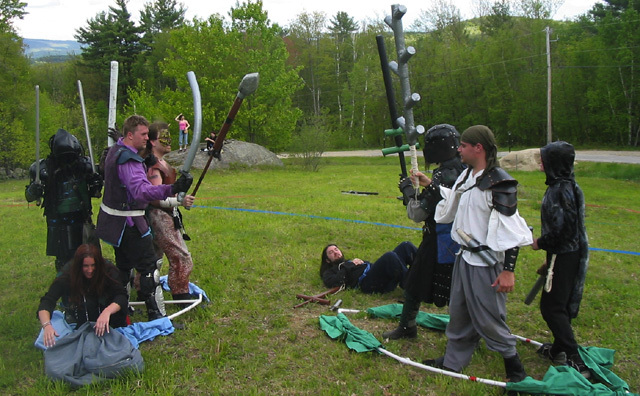 There are 7 staple types of battles in combat larp, but that’s not all. It just scratches the surface of possible types of conflict. While the previous post was about seven simple kinds of battles, this post is about one which requires a bit more gear. 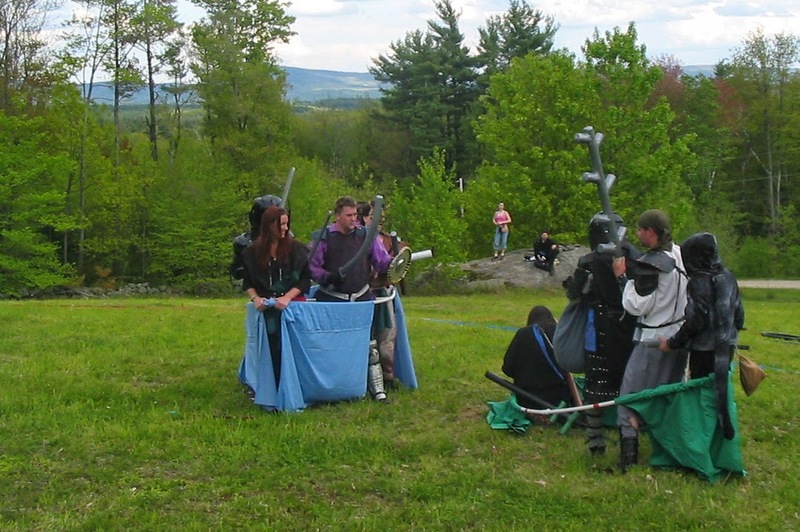 For certain themes of larp, this type of battle may be crucial. Careful though, if you want ‘simple’ or ‘low set up’, probably skip this one. 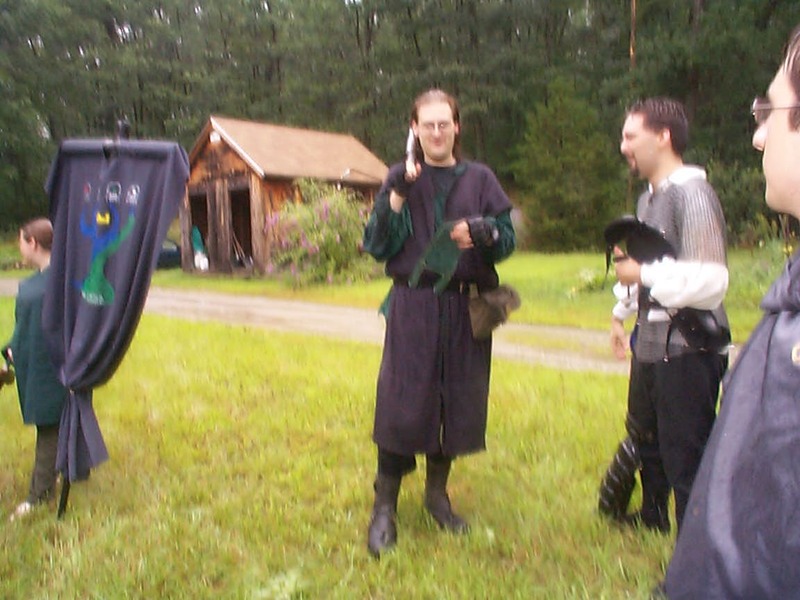 But hey, larp is all about logistics, right!? Like the Fort Battle and the Bridge battle this type of combat requires some setup. The battle is set on a large open field. A level field is best, but sloped works in a pinch. The event holder lays out a ‘sea scape’ using varying depths of water. These depths are marked using colored rope, surveyors tape, or other brightly colored and flexible material. Use tent pegs to secure them to the ground. Mark an area as ‘Beach’. On the Beach players can move normally. Mark another area as ‘Shallows’. Any player in the shallows must get down on their knees while moving. Any player wearing metal armor (plate or chain) has a slow count to 10 before they drowned. Mark a third area as ‘Deeps’. Players many not move in the deeps at all. In fact any player in any armor is killed if they enter the deeps. Players with spells or abilities that grant them Flight, may move as normal. Although for game play balance limit what flying players, with natural wings, can carry on them. No Plate mail flying warriors. Disc riders, flying by spell, and similar effects would probably be allowed more lee way. Players who can breath water, either naturally or by spell would have the greatest advantage at sea as they would not drowned. They do still have to move on their knees, however. Add a ‘Free Action’ movement spell, and then the player can move normally even in the deeps. This dashing fellow (it’s me) was lost at sea once. The ocean terrain is now a movement hindrance and a possibly lethal location (my persona know this from first hand experience). So how do normal players survive during an Ocean Battle? Just like in real life to participate in battles at sea, you should have a Ship! And what better way to make one for larp than with PVC? The ships pictured below represent small rowed galleys. The small ships require two crew to move, and can hold up to three armed players. They key to good ship to ship combat is practicing how the ships move. A player for and a second player aft produce the movement for small ships, such as the ones in the example. Larger ships may require more players to provide the moment. They represent the crew. Killing those players prevents the ship from moving. All players engaging in ship to ship combat should practice a few times before going to conflict. Many players start out attempting to walk in straight lines. They might need a little training to move the ships in ways which mimic nautical motion. One tactic, often used in real naval combat, is to carry ranged weapons. Stay just out of their range, while still firing on their crew. Unfortunately these players didn’t have much in the way of bows or ranged magic. So they fought by boarding party. Even if the battles break down into what basically amounts to line battles they can still be fun. The players always have to be concerned about the water around them. When starting to undertake nautical adventures keep things simple. There are plenty of ways to keep Ocean Battles from getting dull. Add more difficult terrain. Increasingly powerful sea monsters. Encourage players to use larger and more sophisticated boat patterns. You can even layer the other types of battle on top of an ocean battle. But most fun of all is when a house gets together and decides they want to be Pirates! Enthusiastic players are the best. If you incorporate Ocean Battles send over some pictures! As always you can tweet links to me. Leave me a message on Google Plus with detailed feedback. Feel free to write up a post event report and post it to /r/larp. I’ll probably find it there too!